The Oklahoma State Capitol is perhaps the most memorable landmark in Oklahoma City. 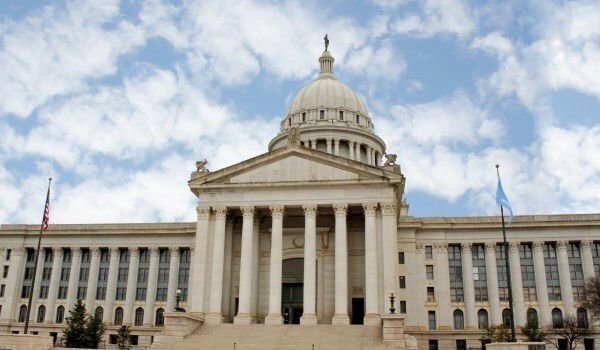 It is home to both the rulers of the U.S. state of Oklahoma and the Supreme Court (located on the second floor). In the west wing of the Capitol is the House of Representatives, and east is home to Oklahoma City Senate. The building is by the well-known Solomon Leighton. The building was constructed in the period 1914-1917 year in Greco-Roman (better known as neo-classical) style. Then the total amount needed to build the Capitol, was approximately $ 1.5 million. The interior of the Capitol is also very inspiring. The building has more than 100 works of art, each of which has a unique history. There you can find magnificent murals, memorial portraits, as well as numerous original paintings, which create a unique atmosphere. At the Capitol there is a small museum telling the history of the city and the U.S. The Capitol each year is visited by tens of thousands. Sightseeing lasts 45 minutes, during which visitors learn interesting facts about the area. The materials used to build the remarkable composition are mainly white limestone and pink granite. It is interesting to note that the characteristic dome of the building (as are almost all in the U.S. Capitol) was built later, as after the outbreak of World War I the coffers of Oklahoma City had insufficient funds remaining. The majestic dome was completed only in 2002. Today, it captures all design drawings pf the creator of the building - Leighton. Under the Rotunda, a fresco was painted by Mike Loresen called "Flight of the Spirit." Above the dome stands the bronze statue - "Guardian", embodying the image of an Indian guarding his family and tribe. The renowned architect has designed several memorable buildings in Oklahoma City - namely Skirvin Hotel, Capitol Power Plant, and the building of the insurance company Mid-Continent. Works of Solomon Leighton stand in other U.S. cities. His are the Marland's Grand Home in Ponca City and Fine Arts Building, located on the campus of Northwestern Oklahoma State University in Alva. The national historic landmark - Oklahoma State Capitol, is located on Lincoln Avenue. It is open to visitors every day from 8:30 to 5:30. Around the Capitol is a picturesque State Capitol Park, which has exposed sculptures and other works. Close to Capitol Park are many restaurants and places to rest.